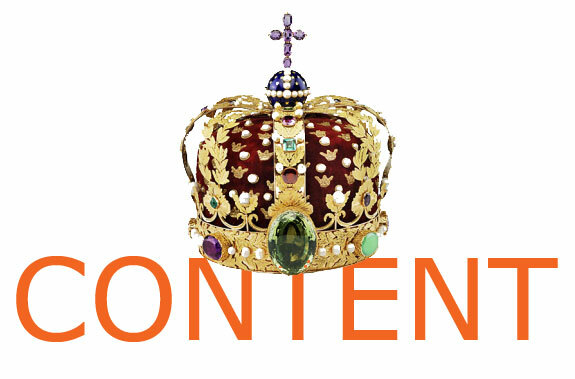 For a long time now, most web folks have known that “Content is King”. What does that mean? Great content can get visitors to your website. Great content can keep people on your website. Great content gets people to link to your website. Great content can get search engines to rank you well. Keeping content fresh can help maintain your good search engine results (SERPs). What do I mean by content? The content I’m referring too can be text, products, photos, videos, social media, blogs, white papers, comments, polls, rankings and anything else that adds something to your website. What makes content so important? As a search engine optimization (SEO) geek I know, right after the very basics like meta information, the most important thing to consider in trying to rank high is content. The search engines love text, especially when it is relevant and supports the rest of the websites content. By relevant I mean, adding a chocolate chip cookie recipe to an architecture website probably won’t help your relevancy. Adding an article about computer aided design (CAD) might. Google will tell you that one way to get better rankings on search engines is having quality inbound links to your site. You can hire a link building person to scour the web looking for opportunities, or you can develop content that someone might be interested in linking too. I hate the term but “Link Bait”, or creating content with the intent to encourage links, is a great way to increase where you rank in the SERPs. Besides the search engines, believe it or not visitors to your site like good content. Using the example above, let’s say a visitor comes to your architecture website and the first page they come across is an article on chocolate chip cookies. The likelihood of the visitor staying on the site is low; the likelihood of them turning into a conversion is even lower. Alternately, if you have content the visitor is interested in, they are much more likely to stay or comeback. Where can I get great content? The biggest problem with great content is getting great content. Most companies don’t have the resources such as technical writers and content marketing specialist on staff. It can be expensive to generate and maintain content. In an article I came across on eConsultancy entitled, “Your company is awash with great content” they demonstrate all the resources companies can leverage. Below is an exert from that article listing resources you might not have thought of. Inside the heads of your people. Not just your smartest or most senior people; your front-line sales and support people too; and your product people. In customer communications. Your customers are a prime source of Grade A content. Almost every interaction has at least the germ of a blog post. In sales proposals. The things you use to get people to take out their checkbooks. In promotional bumf. These days, marketers discount all those data sheets and product brochures and case studies as ‘old-school’ content. But there’s gold in those pdfs (if you’ve got the pan to swish it out). In what other people say about your world. Journalists, bloggers, analysts and experts are all paid (in one way or another) to secrete content. Get your paper towels out. In everyday working docs. Those banal process documents meeting reports, project summaries and status updates. In emails. Your email store is absolutely packed with content ready to discover and unleash. In your In box and your Sent folder. Internal emails. External emails. Marketing emails. Viagra spam. (Okay, maybe not Viagra spam – although I did once write a post on it). In your social channels. Stop tweeting and just listen to every one else’s tweets for a few hours. Dig under the self-promotional layer in every LinkedIn group. Peel back the social veneer of Facebook. Shine a light into the darker corners of YouTube, Slideshare and Pinterest. That is a difficult question to answer. The short of it is, it’s different for every website, company, market, etc. My suggestion is do your research. Figure out what your customers are reading, viewing, liking, retweeting and do more of that. Posting one article will not help, be consistent. Ask your sales people or heaven forbid, ask your customers what they might be interested in seeing. Having great, relevant content is not easy. If it were, everyone would be doing it. Does this look familiar? Isn’t it sad that we have to resort to this type of drivel to get any kind of rankings on the major search engines? Hey, listen, I do the same thing, but wouldn’t it be nice if there was another way? If this is where you were thinking I was going to have some practical solution to resolve this dilemma, then you’d be wrong. At this point there is no option. Do what Google wants or don’t get ranked. So we will keep on writing website content that is awful and not to mention confusing to the customers, and maybe some day there will be another way.